A dozen religious Zionist organizations have united to hold a "summit" calling for Jewish sovereignty over all of the Holy Land, meeting on the same day as the Annapolis summit. The title: Sovereignty for the Jewish Nation Over the State of the Land of Israel. "Recognizing that the Jewish Nation does not have a representative body," the formative statement begins, "and greatly fearing that the government in Israel is undermining the fundamental interests of Jewish existence (based on its declarations and actions in anticipation of the Annapolis summit), we - many right-wing movements and organizations - have united together to convene a counter-summit. Our goal is to emphasize what we stand 'for,' not 'against.'" The founding session of the New Jewish Congress will be held on the 17th day of Kislev, Nov. 27, in Jerusalem - the day on or after the scheduled Annapolis summit. The date for the Annapolis meeting has not yet been finally set. Among the initiating organizations are: Manhigut Yehudit (Jewish Leadership), Land of Israel Task Force, Cities of Israel, the Temple Institute, and the Sanhedrin. Also participating are Mateh Tzafon, Task Force to Save the Land of Israel, Women in Green, Nahalal Forum, and Honenu. 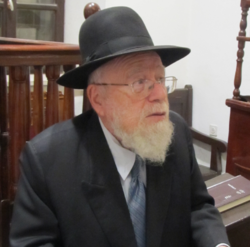 Rabbis who have lent their support include Kiryat Arba/Hevron Chief Rabbi Dov Lior, Rabbi Adin Steinzaltz, author of the Steinsaltz Talmud, Chabad messianist Rabbi Shalom Dov Wolpe, Rabbi Yoel Schwartz of Nahal Haredi, Rabbi Yisrael Ariel of the Temple Institute, and more. What an absurd time we live in, when the religious Zionists have become more Zionist than the Zionists, and borrow the rhetoric of the anti-Zionist Jews for use in their campaign against them: "Recognizing that the Jewish Nation does not have a representative body and seeing that the government of the State of Israel is undermining the fundamental interests of Jewish existence, we have united in protest against them."